This week is the Warfield Concerts Music Festival Week. 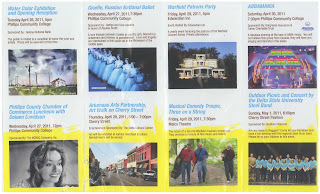 Warfield Concerts are a gift of Samuel Drake Warfield who was a Phillips County resident who desired that his farmland be sold and the proceeds used to promote the arts. The Warfield Concerts Committee is currently comprised of Mrs. Maureen Jones, Ms. Susan Carter and Mr. Don R. Etherly. Each year the committee makes an effort to bring quality entertainment to our community through the use of free musical concerts and informative events. They bring in school children by the busload for events. Churches are known to bring van loads or bus loads from miles away for the concerts. Many citizens look forward to these concerts and have for a long time. Many local people and businesses sponsor the concerts. 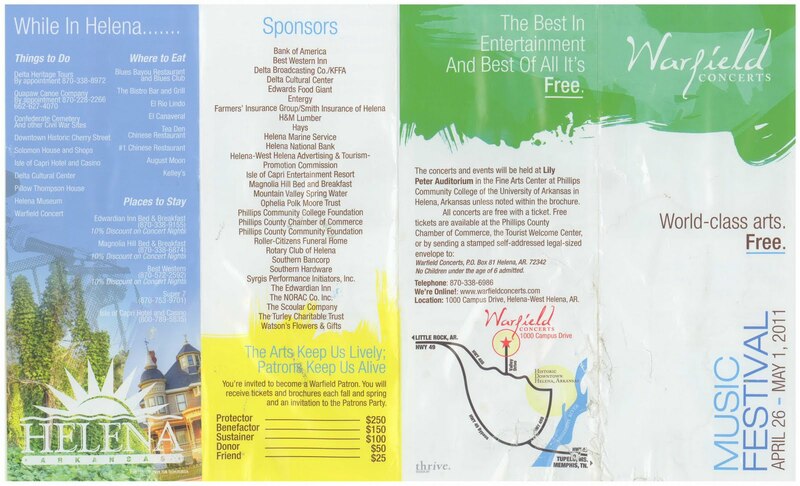 There are also corporate sponsors from outside of the local community. These important participants are listing on the program pamphlet at the beginning and end of this post. 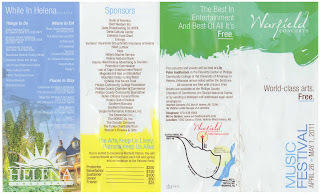 Please remember these sponsors; they are helping to keep Warfield Concerts alive as the "Arts Keep Us Lively." 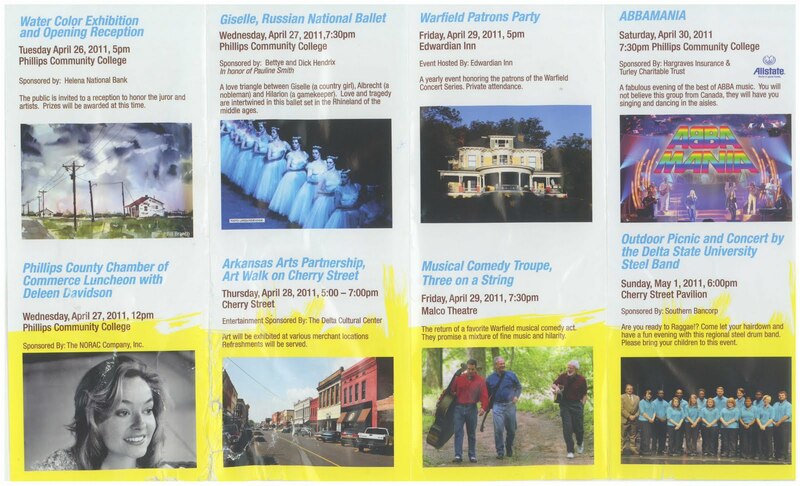 The Thrive Center and the committee are responsible for a well put together program pamphlet which promotes Helena-West Helena and suggests things to do, places to stay and restuarants at which to eat. April Mondy is the beloved daughter of Mr. and Mrs. Elijah and Belinda Mondy, Jr. They own KJIW radio station here in Helena among three radio stations in their broadcasting network. April is a member of the Delta State Steel Band and will be performing among the band members here in her hometown, this Sunday, May 1st at 6:00 p.m. on Cherry Street. She has and continues to make us hometown proud through her achievements at Delta State University which has been dubbed by some, The Harvard University of The South. On April 19, 2011, the Delta State University College of Business held its Awards and Scholarships Recognition Banquet. The event took place in the State Room of the H. L. Nowell Student Union Building on the Delta State University campus in Cleveland, Mississippi. Before a packed house, April Mondy, who will be graduating in May with all A's, received three (3) separate recognitions. First, during the awards presentation, she was presented with the Holiday Inns Oustanding CIS Senior Award which is awarded to the Senior CIS major with the highest GPA. CIS stands for Computer Information Systems which is April's major area of study. Secondly, April was presented with two scholarship recognitions: The Holiday Inns Scholarship and the AITP Service Scholarship. The Holiday Inns Scholarship is awarded to an outstanding student majoring in Computer Information Systems. This scholarship was endowed in 1980 by Holiday Inns to honor six of their staff members who were Delta State Students. The AITP Service Scholarship is awarded each semester to a member of the Delta State University Student Chapter of the Association of Information Technology Professionals who has provided outstanding service to the organization. April Mondy is ineffable in her quest to do good. We salute her with the words that redounded throughout the student union on April 19th: just "OUTSTANDING!" We are proud of Warfield Concerts and proud of April Mondy. We hope to see you, your friends and family at the concert on Sunday, if we do not see you tonight or tomorrow night.